FRIENDS. I am so excited today, because I get to share with you pretty cover art. 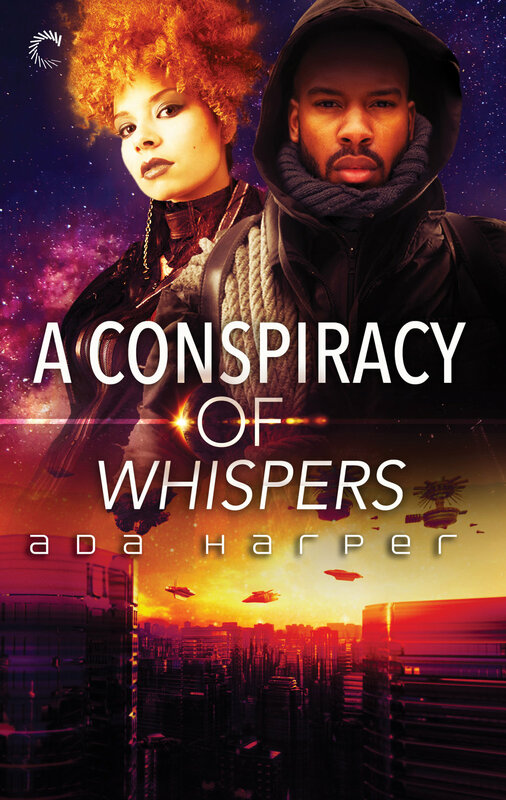 My sci-fi romance debut novel, A Conspiracy of Whispers, is being published by Carina Press under my romance pen name, Ada Harper. It's a enemies-to-lovers epic romance and a feminist war story full of action, alien wolves, murder cats, and, of course, conspiracies. And you can pre-order it right the heck now on Amazon, B&N and various other ebook retailers. Don't forget to check the end of the post to see how you can win your own signed copy! A Conspiracy of Whispers features Olivia, a mercenary with a secret struggling to survive on the edges of a harsh society, and Galen, an honor-bound soldier who's all but abandoned his gentle soul in his duty to his noble family. I wrote A Conspiracy of Whispers to play with popular romance tropes and write the kind of romance I like to read. They're both incredibly competent, strong individuals, an equal match, and it was really important to me that the cover art reflected that. A Conspiracy of Whispers is now available to pre-order! The book releases January 15th, and you can get sneak peeks and extras by signing up for my newsletter or following me on Twitter. To celebrate, I'm giving away two signed author copies! Carina Press is a digital-first publisher so future print editions are not guaranteed--this is your chance to get one! For the chance to win one, simply share the cover reveal on social media and tag @adahwrites on Twitter or Ada Harper on Facebook. Winners will be randomly drawn and announced January 1st, 2018, with author copies in the mail as soon as I have them! Newer PostA Treason of Truths -- out now!